At the PMA 2006 show where Panasonic held a press conference the new Panasonic DMC L1 was officially introduced. The new Panasonic L1 is the first Panasonic dSLR product that is the result of the cooperation between Olympus and Panasonic. 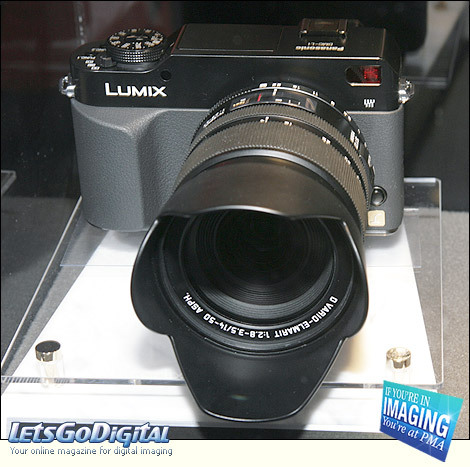 The Lumix DMC L1 also reflects Panasonic in-house technologies where the Lumix series got famous for. The new Leica D lens system is also a system that has been introduced by Panasonic to be combined with the Panasonic dSLR system cameras. The new Leica lens is a high quality lens and is the only lens that meets the professional demand for high quality system lenses. 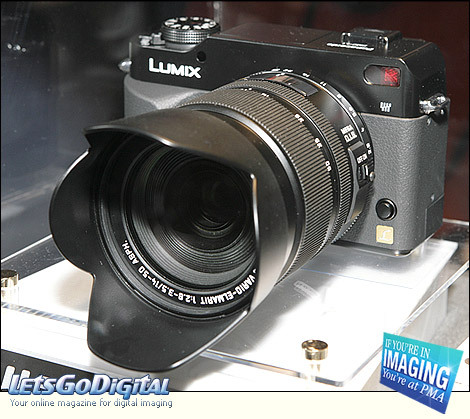 The Lumix name will be a brand name that stands for high quality all round photo system. Panasonic L1 - Leica lenses - Dr. Josef Spichtig, CEO of Leica Camera AG, states: "Digital photography will benefit from the Leica quality. Leica is cooperating with strategic partners. The cooperation with Panasonic is the first step Leica will make to get further market share in this highly competitive market. The first Leica product is an exciting lens product that will be sold together with the Panasonic DMC-L1 DSLR camera. Further lenses will be developed in the upcoming period. We welcome the open standard of the FourThirds system en we hoping to join the FourThirds system." Sigma FourThirds system lens line-up - "Sigma joined FourThirds system standard in 2003 and released 3 lenses for the system in October of that same year. The new Sigma 30mm f/1.4 EX DC, Sigma 18-50mm f/2.8 EX DC, Sigma Macro 105mm f/2.8 EX DG, Sigma APO Macro 150mm f/2.8 EX DG and the Sigma APO 50-500mm f/4-6.3 EX DG are the latest lenses for the FourThirds System that are scheduled for 2006," said Kazuto Yamaki from Sigma Cooperation. Panasonic DMC L1 - Lumix digital SLR - According to Mamoru Yoshida: "Lumix first digital SLR camera has a analogue like operation and offers a high quality picture quality of 7.5 Megapixels. The easy-to-use dail operating system combined with the high-grade metallic appearance result into an enjoyable operation. The full time live view function have a big advantage for the user. The LiveMOS sensor is made in a joint cooperation between Olympus and Panasonic. The biggest problem with the digital SLR camera is dust. By cooperating the Dust reduction system Panasonic eliminates the dust problem. 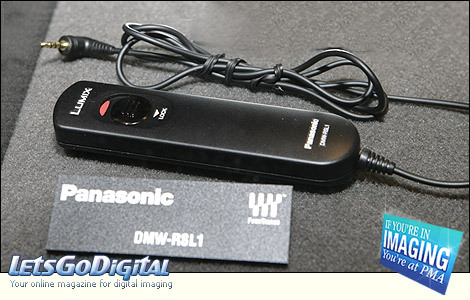 The Supersonic Wave filter is a great advantage within the new Panasonic L1 camera. Add the MEGA O.I.S to the system and blur will be effectively eliminated. 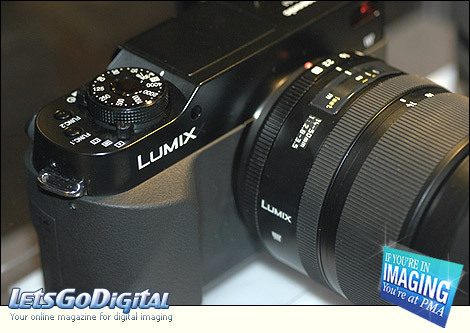 Furthermore the Panasonic DMC L1 benefits from the Venus Engine LSI. In combination with the Leica D Vario-Elmarit lens 15-50mm f/2.8-3.5 ASPH Panasonic offers a unique high quality dSLR system. Unique is also the aperture ring giving the user the traditional operation of the analogue single lens reflex camera. Panasonic DMC-L1 - Dust reduction system - The most critical and annoying problem with digital SLRs with interchangeable lenses is the possibility of dust getting inside the camera during lens changes, contaminating the image sensor. If this happens, professional cleaning is often required. The DMC-L1 takes care of this problem by incorporating a Supersonic Wave Filter dust reduction system. The system uses supersonic vibration to instantly shake off any dust that might otherwise affect the image. Panasonic Lumix DMC L1 - Dust reduction system - Furthermore, the Panasonic DMC L1 features 7,5 Megapixels and a 2.5" high-resolution LCD. DMC-L1 achieves a full-time Live View function that displays the image on the LCD directly from the sensor signal. This function can be selected in both Auto Focus and Manual Focus modes. In Manual Focus, it allows the user to enlarge an image within the frame and then select the area focusing. This makes it easy to check the focusing condition on the large 2.5-inch, high-resolution, 207,000-pixel LCD. 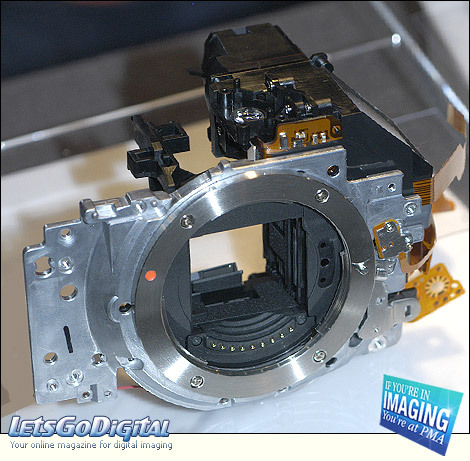 Panasonic L1 -Venus Engine Ill - The Panasonic DMC L1 features a Venus Engine III image processing LSI that was newly developed to maximize the performance of the Live MOS sensor. While inheriting the earlier Venus Engine's high resolution, superior color reproduction and detailed gradation, the Venus Engine III also reduces noise to the level expected from a digital SLR camera, to help render smooth images. The Venus Engine III improves camera responsiveness too, supporting high-performance consecutive shooting and a short shutter interval. Despite the considerably higher performance, the Venus Engine III consumes only 80% as much power as the Venus Engine II. This combines with the Live MOS sensor's low energy consumption to provide longer battery life.